An armed man in a dinged-up minivan robbed two commuters in separate hold-ups Wednesday morning. Neither victim was injured, and the offender remains at large, police said. 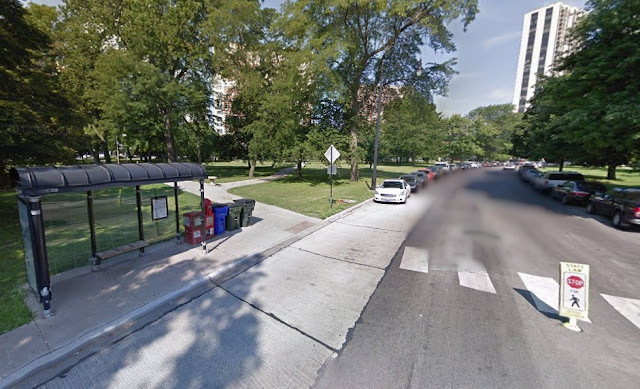 A Lincoln Park man was robbed around 5:15 a.m. as he waited for a 151 Sheridan bus in the 2400 block of North Stockton Drive. He told police that a man in a white Dodge Caravan drove up, pulled out a semi-automatic handgun, and demanded his valuables. The offender got the victim’s lunch box and an Under Armour-brand gym bag containing two cell phones and a laptop, according to police. The van, which had damage to the front driver’s side door, was last seen heading north on Clark Street. Police said the offender was a younger black man who stands 5’4” to 5’8” tall. He had braids and wore a black jacket with black pants. Yesterday's robbery is at least the third to be reported in the park near Diversey Harbor since July 25. About an hour later, a North Center man was targeted in a similar hold-up. The second victim told cops that he was getting into his car in the 4300 block of North Oakley when an armed man pulled up in a white minivan around 6:20 a.m.
An offender, who appeared to be wearing a security guard uniform, pointed the gun at the victim and demanded his property. He then drove off after getting the man’s wallet, phone, and backpack, according to a police report. According to the victim, the minivan had a disability license plate that may be from out-of-state. The offender was a black man with medium-length braids in his mid-20’s. He wore a white t-shirt with a dark blue shirt on top and a gold chain. • Three men jumped out of an older-looking, black 4-door sedan and tried to rob a man near Montrose and Western around 10:50 p.m. The offenders were armed with a handgun, but the victim managed to slip away without injury. He described the offenders as two Hispanic men 18-20 years old and one black man 18-20 years old with short black hair and a black handgun. All three men wore blue jeans. • In Uptown, a 35-year-old man was beaten by two offenders who tried to rob him and take his car near Clark and Lawrence around 1:30 a.m. The robbery failed, but the victim suffered cuts to his face and was bleeding from his ear, according to a witness. Both offenders were black men, one wore a white shirt, and one wore a black shirt, police said.